Senior United Airlines flight attendants will get buyouts offers worth as much as $100,000. United Airlines is about to make some of its flight attendants very happy on their way out the door. The airline and the flight attendants' union have agreed to voluntary buyout packages worth up to $100,000 for the more senior flight attendants. The offer also means that about 1,450 flight attendants now on temporary layoff will be recalled to work. United spokeswoman Megan McCarthy said the airline expects at least 2,100 employees to get the buyouts. She said United has about 2,000 more flight attendants than it needs. But the reduction in staff that will take place with the buyouts will not reduce the number of flight attendants on flights, McCarthy said. United (UAL) has more than 23,000 flight attendants now on staff. The airline did not disclose the typical pay for its flight attendants. Salary tracker glassdoor.com puts flight attendant annual pay at the airline at just under $36,000, which is in line with Labor Department estimates for pay for the job. 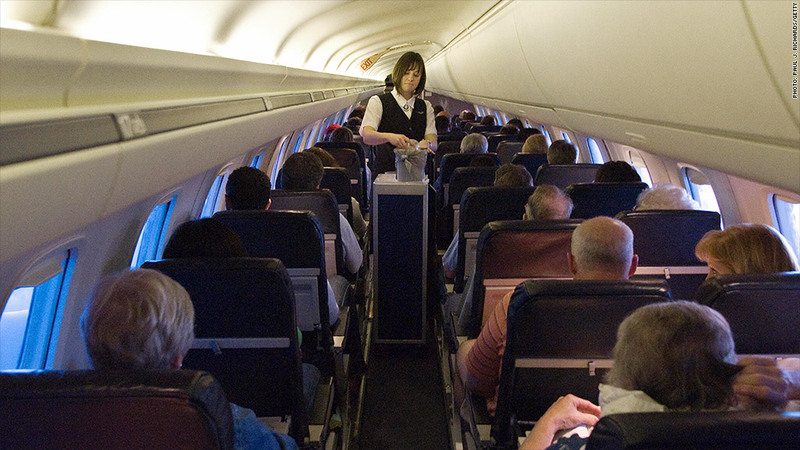 Senior flight attendants who are being offered the buyouts are likely earning high wages. The union said the agreement will be an important boost to employee morale, providing more job security for those who remain with the airline.